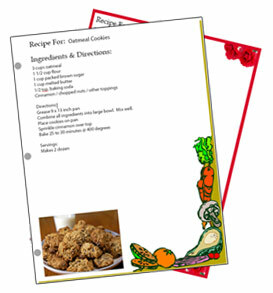 Enjoy recipe cards made just for your notebook or 3-ring binder. 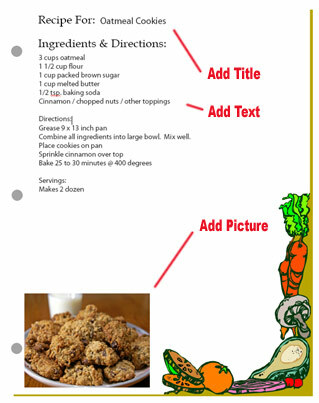 Our printable recipe card templates can be customized and then printed - even with a picture of your dish if you like. We also have a two decorative formats. All you need is your computer, Adobe Acrobat software and an online connection to complete your recipe card mission. Below we layout a few simple steps to download and create your custom printable recipe notebook sheets. 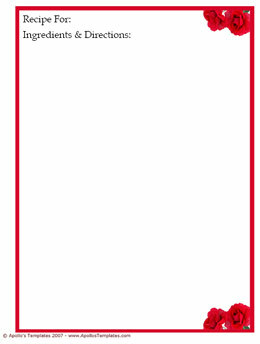 In step one you will download the blank printable recipe card, and then in step two we will guide you in personalizing the card. Please be patient while downloading the Recipe Card Templates as the file sizes are large. 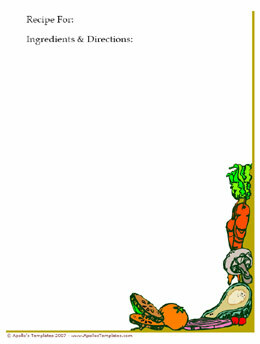 Step 2 - Customize Recipe Card Template and Print! Once you have successfully opened your recipe card template into Adobe Acrobat, you can add text to the "Recipe For", "Ingredients & Directions" and "Servings" sections. Simply place your cursor in the appropriate places and type. You can also just print these out and hand write the cards. Also notice that beyond the title and text, you can also place a picture in the bottom right hand corner of your recipe card. Simply click on your PDF template in the same place you see the picture to the right. This will open up a browse window that will allow you to find your picture on your local machine. The picture size format is the standard horizontal size taken by most any camera. Horizontal pictures will get stretched and are not recommended. Also - let us know if you create a link to us from any personal website you have access too they are always appreciated! Note: Remember that you can't save changes to your printable recipe cards in Adobe unless you have Acrobat Professional. So you will want to customize and then print copies when complete. Making life a little easier with our free Recipe Printable Recipe Card Templates!